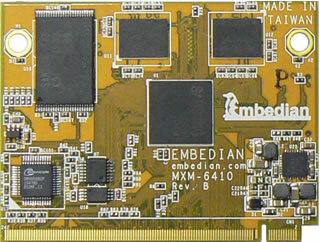 MXM-6410 Computer-on-Modules is built around the Samsung S3C6410 ARM1176JZF-S core at 667MHz. It is well-suited for OEMs designing computing platforms into equipment for industrial or harsh environments, and when reducing the overall design cycle and lowering validation costs are of key importance. Onboard components are specifically selected for their reliability in demanding conditions. MXM-6410 serve as a building block in embedded applications.